I made another batch with the recipe from the last post, this time with Michel Cluizel Plantation Los Anconès chocolate, along with the Cluizel cocoa powder. This was an intense trip. I’ve always loved this chocolate, but never knew quite what to do with it, besides, of course, just eating it. It has an unusual and intense flavor profile, full of wood and liquorice and dark fruits and green olives. Please trust me that this is better than it sounds. It’s rather magical, actually, although I’ve thought it might be a little overwhelming to people in large quantities in desserts. It’s one thing to know you’ve just bought an expensive and unusual candy bar; it’s another thing to be blindsided at the dinner table. The verdict? I like it. Better than any chocolate ice cream I’ve had before. Your mileage may vary. The origin flavor is muted somewhat by the cocoa powder, which provides a less three-dimensional, straight-ahead intensity. The olives and wood and smoke and spices are present, but not much fruit. The flavor is complex. It’s dark. I want more. If they ever make a Los Anconès cocoa powder, I’d love to try this origin undiluted. With this or any ice cream made with real chocolate, pay close attention to serving temperature. Let it warm up to the point that it feels soft against the edge of a spoon before serving. If the ice cream’s near freezer temperatures, the cocoa butter will take too long to melt in the mouth and you’ll get slow flavor release. This means muted flavors, and the impression of a watery melt. Which is a shame, considering there’s over $8 US chocolate in a quart of this stuff, and that’s when you buy by the kilogram. If you want your guests to taste an explosion of chocolate, and to experience a rich and creamy melt, slow down and let the ice cream soften all the way through. Here’s a thought worth exploring. If you’ve ever used chocolate for enrobing or candy making, you’re familiar with the idea of tempering—a process of timed heat treatment used to produce chocolate with a shiny, dry finish and a melting point that’s close to body temperature. If you melt chocolate and let it harden on its own, you get something much different from this. What’s going on here? Cocoa butter, which provides the solid structure of chocolate, can in exist in any of five crystalline states called polymorphs or “forms,” each with different melting points and other qualities. 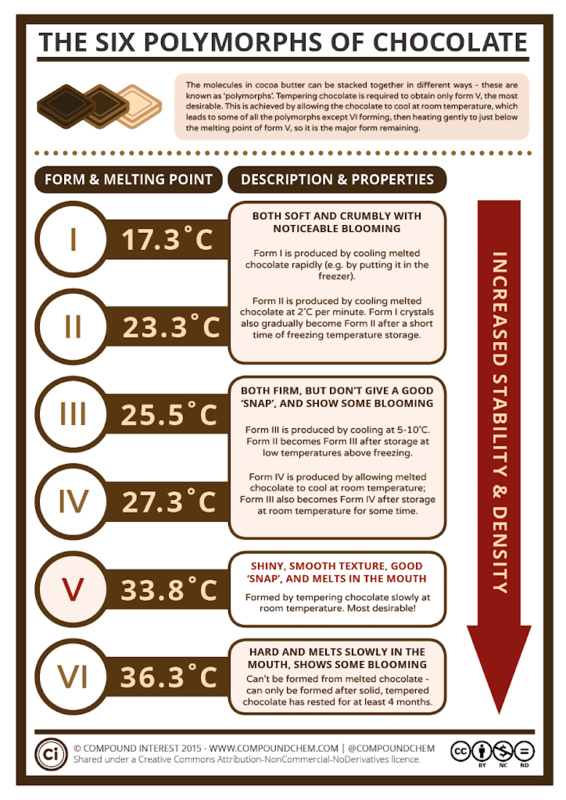 Form V. is what chocolatiers aim for. We’re not looking for gloss and snap in ice cream; we’re looking for the softest, fastest melting cocoa butter. With gradual cooling of the ice cream mix after cooking, we probably get Form IV. This has the advantage of melting point over 6°C lower than that of a chocolate bar. But if we chill the hot mix rapidly in an ice water bath (which should be standard practice, but can be challenging with large quantities) the cocoa butter may crystalize into Form I or II, with a significantly lower melting point? I don’t know if this will make any difference in an ice cream recipe. Cocoa butter behaves differently when it’s in a simple dispersion with cocoa solids than when it’s in a more complex emulsion or blended with other fats. I’m presenting this information because I haven’t seen it addressed elsewhere. If you know anything, or if you’re interested in experimenting, please get in touch. Hi, I've really enjoyed this series, and it's helped me reach an ice cream nirvana I never imagined possible! Have you ever freezed your unspinned ice cream base for a few weeks, then melt it, spin it and freeze it like a regular base? I made few ice cream base, but my ice m cream machine broke down and it will take few weeks till I get it back in action..